Today the ladies and I are so excited to announce a new division of Woman to Woman Ministries! Tasty Tuesday! As women of God and women of our home, we know that we have a job to do in caring for our families. Part of that job is nurturing them. Nurturing takes on many forms. One of those forms is feeding them. Mealtime is a very important part of the day. It's a time when all members of the family come together and sit down together at the table, not in front of the tv, they turn the cell phones off and eat and fellowship with one another. It is a time when the family connects and refreshes. Most typically dinner time is the family meal time, but for your family, you may consider breakfast time or even lunch time the family meal time. 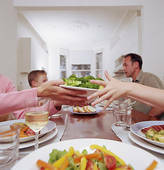 What ever time of the day, we want to encourage you to make family mealtime a priority each day. Every Tuesday, beginning next week, your ladies here at W2W; Debi, Lisa, Mandy and myself, will give you a new recipe. It may be a breakfast, lunch, dinner, dessert or just a fun way to present your meal for the kids. I also want to encourage you to use your cooking time as a prayer time. As you cook for your family, pray for them. What a wonderful way to nurture them physically and spiritually! It is always fun to get new recipes and try them out. Please feel free to pass the recipes on to others. We are looking forward to Tasty Tuesday! Great idea :) can't wait to get your recipes! Yay, I love new recipes! And what a great reminder of the importance of meal times together. We have to fight for our time together around the table. Thanks for the reminder! Hi Jenifer, Thanks for visiting my blog. This looks like an encouraging blog. I do a Tasty Tuesday link-up the first Tuesday of each month.